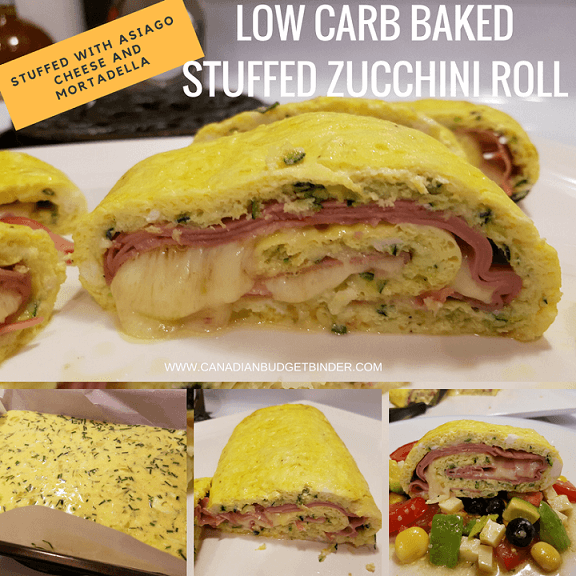 Wow your guests with this simple to make low carb baked stuffed zucchini egg roll that takes no time at all to prepare. It’s time to harvest zucchini and many of you might find that you have an abundance of it since it grows so beautifully in Ontario. Organic produce is best when you can grow it yourself but if you don’t have the option visit a local organic farm or shop the grocery store. 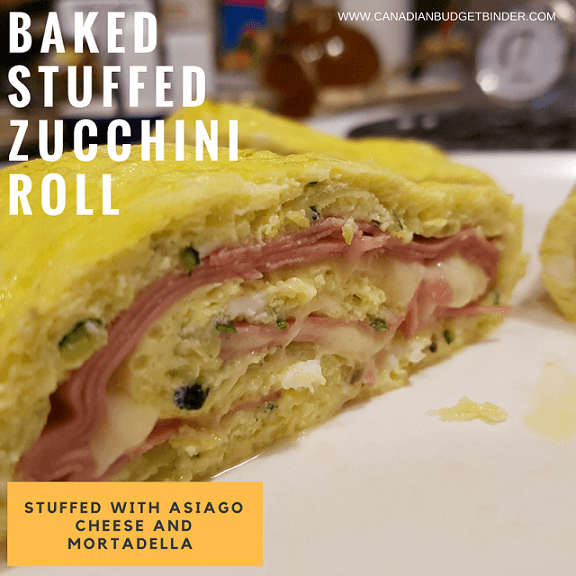 Some of the best zucchini recipes such as my low carb baked stuffed zucchini egg roll boast simple ingredients such as eggs, parmigiano cheese, fresh chives, Asiago and sliced ham or Mortadella. 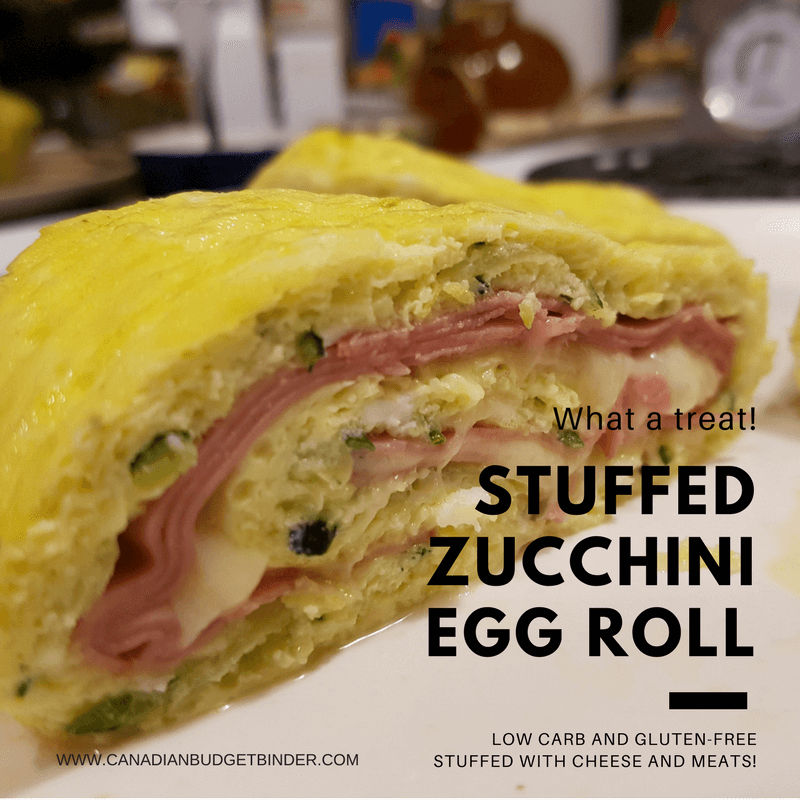 If you’re not a fan of the deli meat you can leave it out for a simple, delicious baked stuffed zucchini egg roll that’s perfect for low carb or keto fans. I’ve been asked this a few times so let’s break it down for those who are curious. What I found out was interesting because like most people I thought zucchini was a vegetable when in fact it’s a fruit. This is probably why it tastes so good in either baked goods or savoury dishes. Zucchini (/zuːˈkiːniː/, American English) or courgette (/kʊərˈʒɛt/, British English) is a summer squash which can reach nearly a meter in length, but is usually harvested immature at 15 to 25 cm (6 to 10 in). In the British Isles, a fully grown zucchini is referred to as a marrow. We are fortunate to have family who grows an organic garden where we can load up on fruits and vegetables when we visit which we haven’t done yet this season. 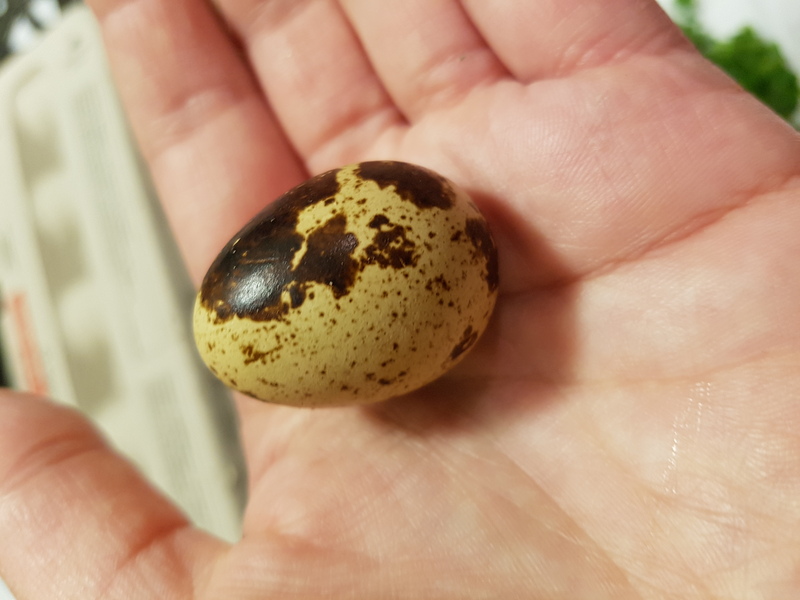 Unexpectedly a friend of ours who lives close came to visit us and brought us some baby green zucchini, garden herbs and a dozen quail eggs. This really made our day. I’ll admit I had to Google what to do with the quail eggs as I’ve never seen or used them before. It turns out that they look like eggs but just smaller. They crack similar to a chicken egg but you have to squeeze the egg out. No big deal really. 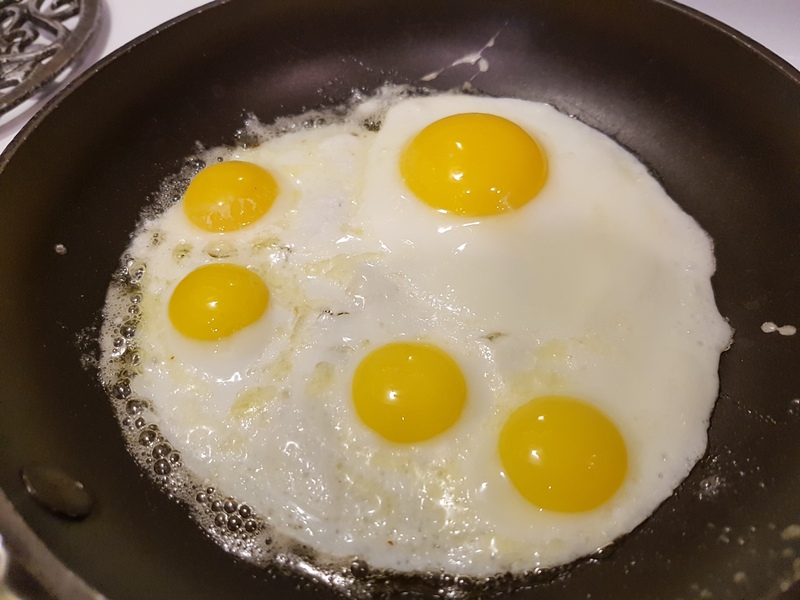 I fried some up along with chicken eggs to taste the quail eggs and they were great. You don’t need to use quail eggs for this recipe however I did substitute in 4 just to use them up. You can use either the green or the yellow zucchini for this recipe although I find the green zucchini holds up best and doesn’t get as mushy as the yellow. Creating healthy recipes starts with the best ingredients and building ideas and flavours like I did today. 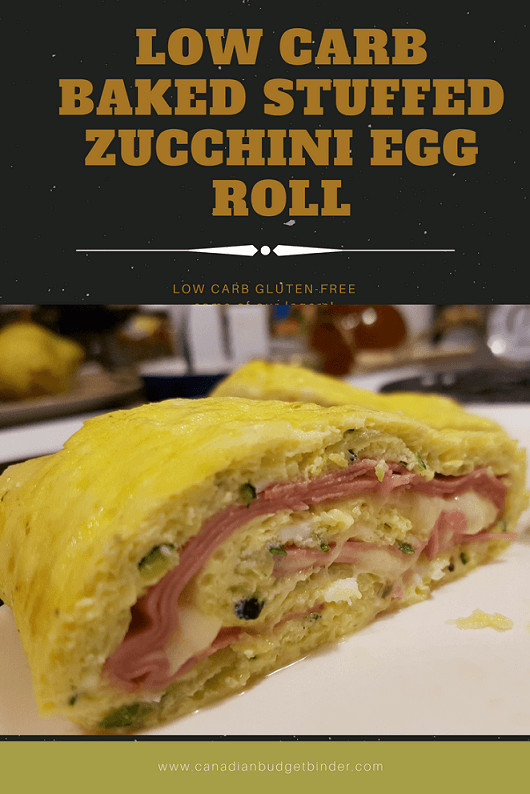 This zucchini egg roll is a standard egg mixture poured over a parchment lined oblong cake pan and baked until buttery and moist like eggs should be. Once you remove it from the oven let it sit until it cools a bit but not too much then fill it with your favourite cheeses and deli meats. We used mortadella which is an Italian Bologna sliced thin that you can find pre-packaged or at your local deli. You can use ham, roast beef, chicken-pretty much anything you’d like from the deli department or baked and sliced at home. I grated the green zucchini on a box grater and sliced the cheese rustic style as I was rushing. Ideally you would want to grate the cheese as well or slice thinly and layer it on the baked egg before rolling it. You could go the vegetarian route as well by adding vegetables but I haven’t tried to roll it that way. If you do make sure your vegetables are pre-cooked so they are soft and won’t break through the zucchini egg roll. Your fingers might get a bit heated when you do the roll but it’s worth it. Some people like to roll it up in the parchment paper and slip it back in the oven to bake and others like myself roll it without and baste it with butter first. The choice is yours. What you get after 30 minutes is a delicious, buttery zucchini egg roll stuffed with melted cheese and meat which we served on a bed of tomato salad. 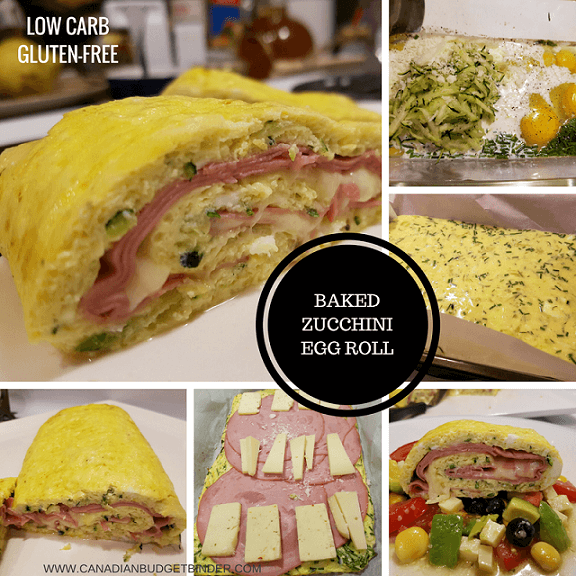 Simple, delicious and low carb. 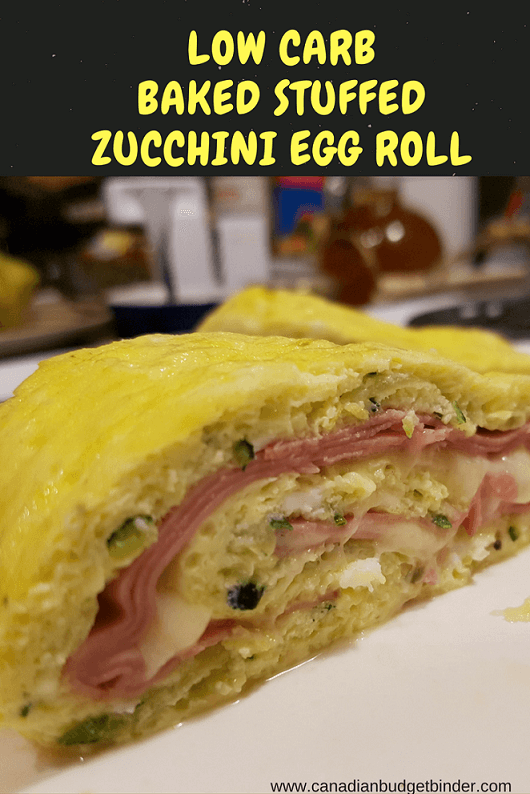 A wonderful mix of golden butter, eggs, parmigiano, chives, Mortadella and Asiago make this simple zucchini egg roll a must try for everyone who loves eggs. layer with your favourite grated or sliced cheese ideally one that melts well Asiago, mozzarella, fontina, etc. Line a 9x13 baking pan or similar size with parchment paper that overhangs the edges so you can pull it out when baked. In a bowl crack your eggs and then add the chives, parmigiano cheese, salt, pepper, zucchini, whipping cream and mix. Add this mixture to the baking pan and bake at 300 degrees until golden or it springs back about 15-20 minutes. Remove from oven and let cool for 5-10 minutes so it's easier to work with. Add your cheese and meats and then roll it slowly with or without the parchment paper. If you keep the roll inside the parchment paper you can stick it back in the oven as is without the added butter on top. I like to brush mine with butter and lay it flat back in the pan and bake until the cheese melts about 10-15 minutes. Take out from the oven and let cool 5 minutes. If your zucchini roll is in the parchment remove the paper then slice into 4 large pieces or 8 smaller slices. Serve with your favourite salad or side-dishes. When you slice the zucchini egg roll you get 4 large pieces or 8 if you want to slice them a bit smaller. Serve as a main dish or mid-day snack. This recipe is perfect for breakfast or even a Sunday brunch. Everyone will love it! Discussion Question: What would you stuff your zucchini egg roll with? Per entire Recipe: 7.8 g Net Carbs Using Atkins Net Carb Counter This will change depending on the meat and cheeses that you use and how much of each.